Support data collector is used to collect some data and sent to OTRS Group on a regular basis, if the system is registered. Use this screen to review the data to be sent to OTRS Group. The support data collector screen is available in the Support Data Collector module of the OTRS Group Services group. Click on the System Registration button in the left sidebar. Click on the Show transmitted data button in the left sidebar. Review the System Registration Data and Support Data in the newly opened screen. Click on the Send Update button in the left sidebar. 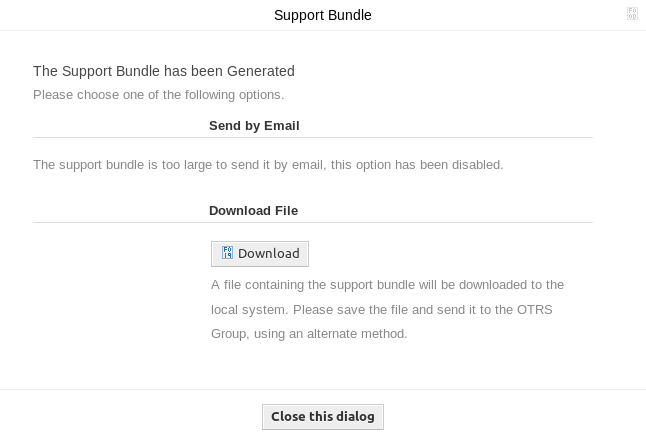 Click on the Generate Support Bundle button in the left sidebar. Download the generated support bundle. Open it with an archive manager and review the content. Gray LED means information, just displays a value. Green LED means OK, the entry has a good value. Yellow LED means notification, you have to check the value, but it is not an error. Red LED means error, you have to do something to solve the issue. This section displays information about OTRS cloud services. This entry shows information about your available SMS messages. If they are getting low, the LED changes to red. This section displays information about the database used by OTRS. Display the outdated database tables. Green LED means, there are no outdated tables. Display whether all needed tables exist in the database or not. Display the character set for the client connection. It must be utf8. Display the character set of the database server. It must be utf8. Display the character set of the database table. It must be utf8. Display the log file size for InnoDB driver. It must be at least 512 MB. Display the invalid default values. Green LED means, there are no invalid default values. Display the maximum size of a database query. It must be at least 1024 MB. Display the size of database. This is just an information. Display the default storage engine of the database. It must be InnoDB. Display the storage engine of the database tables. It must be InnoDB. Display the database driver version. Green LED means, the version is high enough. This section displays information about document search and the used cluster. The name of the used cluster. Display some internal variables of the used cluster. Display the size of each index. Display information about the used node. This section displays information about the running operating system and installed software components. Display information about environment dependencies. Display the disk partition to where OTRS is installed. Display the used space per disk partitions. Display the distribution name of the operating system. Display the kernel version of the operating system. Display the system load of the operating system. The system load should be at maximum the number of CPUs the system has (e.g. a load of 8 or less on a system with 8 CPUs is OK). Display the version of Perl. Display the free swap space as percentages. There should be more than 60% free swap space. Display the used swap space in megabytes. There should be no more than 200 MB swap space used. This section displays information about the OTRS instance. Display information about indexed articles. Display the number of articles per communication channels. Display aggregated information about communications. Display information about communication log account status in the last 24 hours. Display information about the logged in users at the same time separated by hourly. Display information about the number of maximum logged in users in the same time. Display some important configuration settings from system configurations. Display whether the OTRS daemon is running or not. Display the main OTRS object and the related number of records in the database. Green LED means, that the default administrator password was changed. Display the number of emails that are queued for sending. Display the fully qualified domain name set in system configuration setting FQDN. Display whether the file system is writable or not. Green LED means, there are no legacy configuration backup files found. Green LED means, that all packages are installed correctly. Green LED means, that the OTRS framework version is suitable for the installed packages. Green LED means, that all installed packages are verified by the OTRS Group. Display the maximum allowed sessions per agents and customers. Display the number of emails that are in the sending pool. Display the system identifier set in system configuration setting SystemID. Display the ticket index module set in system configuration setting Ticket::IndexModule. Display the number of users, who are set to invalid, but have some ticket locked for him. Display the number of open tickets in the system. You will not have performance trouble until you have about 60,000 open tickets in your system. Display the ticket search index module set in system configuration setting Ticket::SearchIndex::ForceUnfilteredStorage. Display the number of orphaned records in ticket_index table. Display the number of orphaned records in ticket_lock_index table. Display timezone information for OTRS, for the calendars and for users. Display the used skins per agents. Display the used theme on the agent interface. Display some statistics about personal modifications like using favorites, custom menu ordering, etc. Display the version number of OTRS.